My friend Kingsley and I wore Belgians in high school when they were *not* cool. I just had to disclaim that fact as a half-brag, half-embarrassing reveal. Now-a-days I leave the Belgian wearing to my husband who looks extra sharp in them, but I've been thinking: It's a new century, maybe it's time I roll out a new pair. Look No. 1: Photo via Pose, an ultra-cool shopping app (that is launching its next version very soon, more to come on that); J Brand 811 jeans in bright green ($176); Belgian Midinettes in Camel Leopard ($350). Look No. 2: Photo of photographer/DJ Rachel Chandler's feet (not her hand) at Avenue by Oliver Zahm via purple DIARY; Brass Lighter ($20-$50); Belgian Midinettes in Navy Lizard Calf ($325). Look No. 3: Photo of Elle Macpherson's feet via Who What Wear; Original Wayfarer ($145), which Elle was wearing with Belgian Midinettes in Dalmatian print ($350). God those dalmation print ones are amazing. I love the navy ones. The more I read your blog the more I see my own tomboy style!! nothing sexier than a man wearing a pair of Belgians and nothing more classier and chic than a woman wearing them!!!!!!! Is it lame that I've never even heard of Belgians before? Just checked on their website and they seem to run the gamut from hideous old lady shoes to very cool hipster loafers. Interesting... I like the printed pony ones myself. I love Belgians and they are so great on people you wouldn't expect to wear them and with unexpected pieces, like you pointed out. My boyfriend has a few pairs, and after seeing this I think I'm going to get a pair too. These are great. I have a pair that I wear daily. I just wish there were more inexpensive options (like under $100). Thoughts? Great post! I think they are superhot! I agree, I wish they were cheaper! But I don't really know off-hand of a more affordable alternative. I'll dig around though. I had a pair of periwinkle blue suede loafers that I wore in the 80's. I had no idea they were called Belgians. Just like the chocolate (and your blog) they were yummy! I had to post anothe comment as your sensibilities are very appealing to my style. I love androgyny and often blog on it. 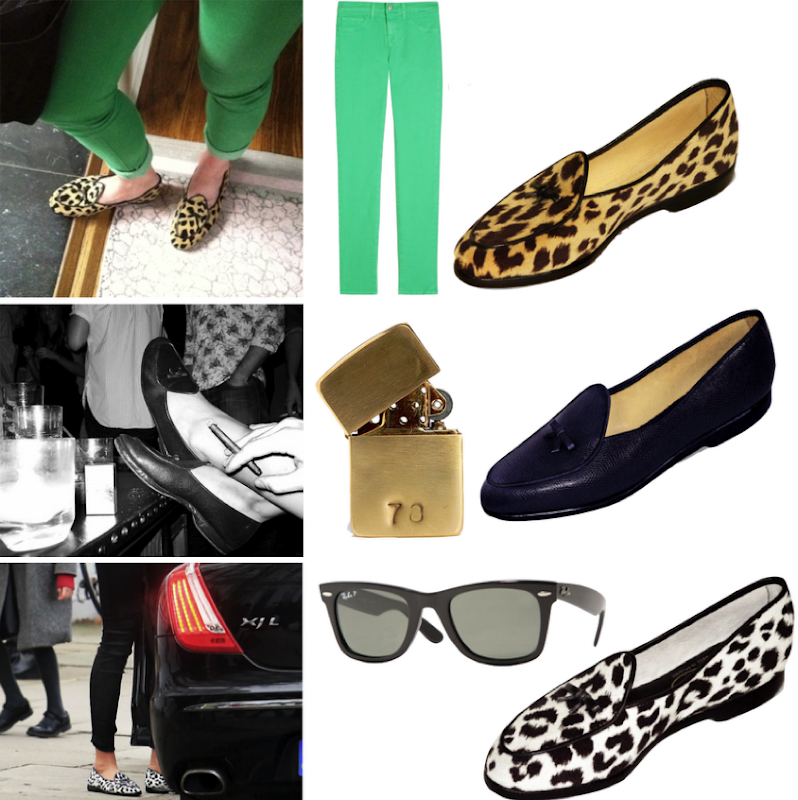 I also love loafers, brogues and flats, they are so much more stylish and cutting edge than heels! Given a choice I find the "tomboy" look much more appealing than a "girly" look. What a wonderful pop of colour for summer! Oh, I have a soft spot for them too! They're so cute & perfect! My husband wears them too, Lizzy! I will have to show this to him! I gotta admit those Belgians sure look great. Gorgeous. Love them with skinny jeans as pictured. steve madden is making a few variations of these but obviously the quality is nowhere near the real deal! I love that loafers with a dalmatian design. It's so cute!!! I never knew that's what I was wearing. I have large feet and they had my size they ar about 20him years old. Guess now I am in fashion. I make this statement not as a criticism.